Over the weekend I had the opportunity to work on this gem of a vehicle. 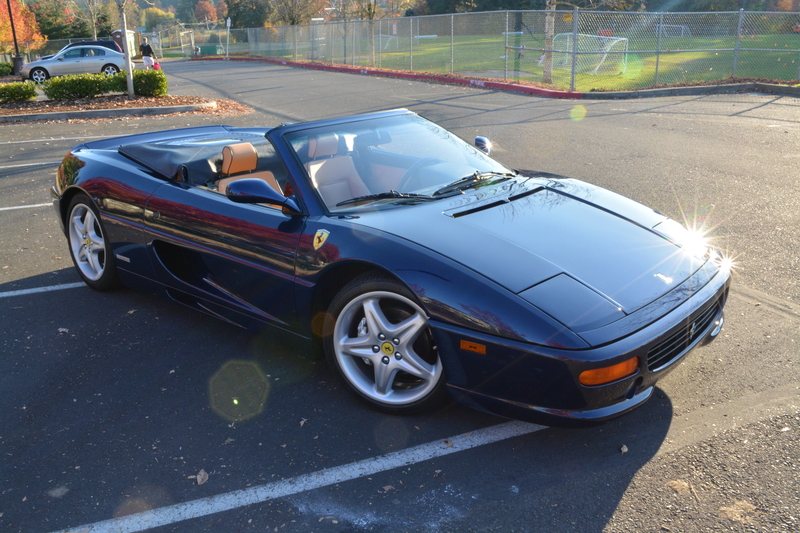 The owner had recently purchased this ’99 Ferrari 355 F1 Spider and was looking forward to enjoying it in pristine condition. 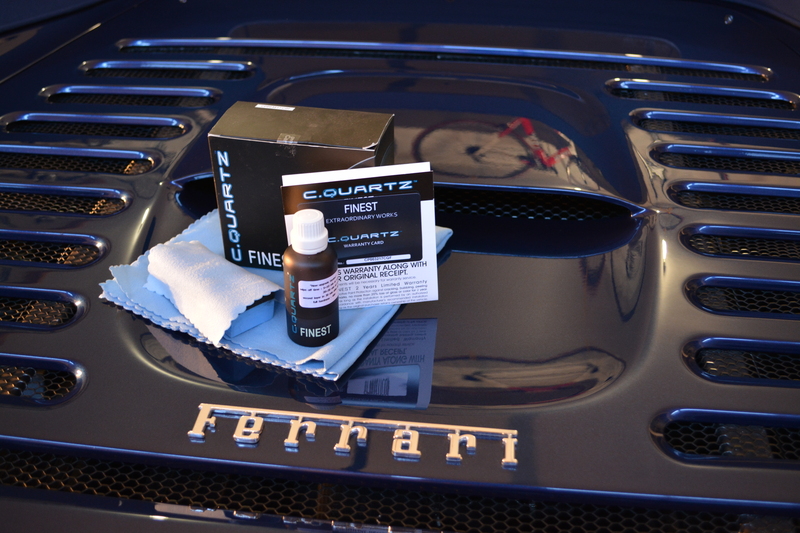 The vehicle will be garaged and only driven on nice days so the plan was to get the paint as perfect as possible and then coated with the most exclusive ceramic coating in the world, CQuartz Finest. 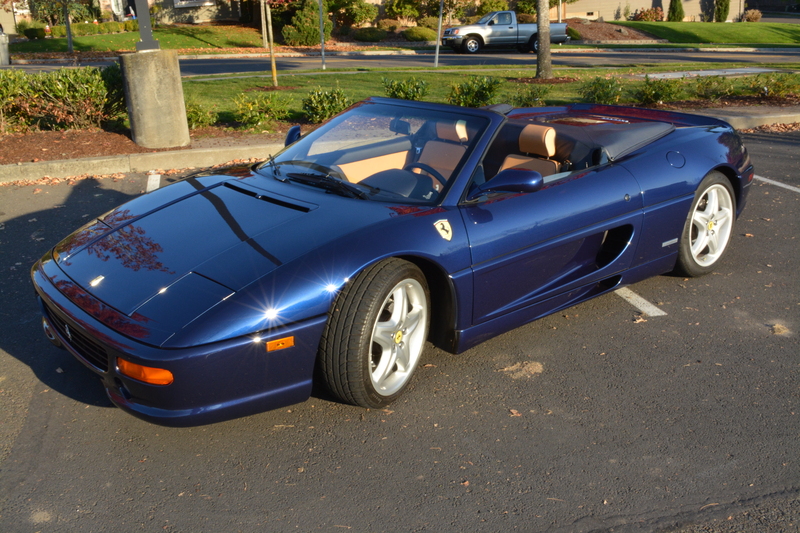 The F355 is the next evolution from the Ferrari F348. 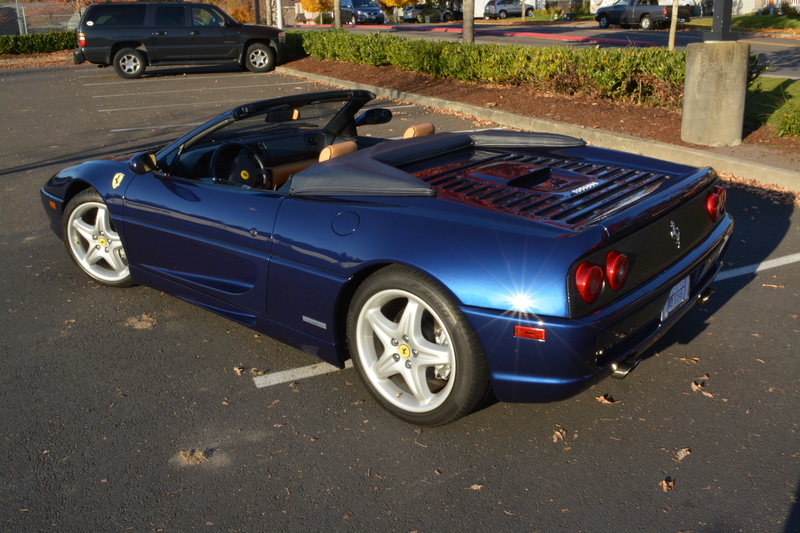 Improvements to the 355 include a slightly larger displacement V8 and the introduction of a 5-valve per cylinder head. 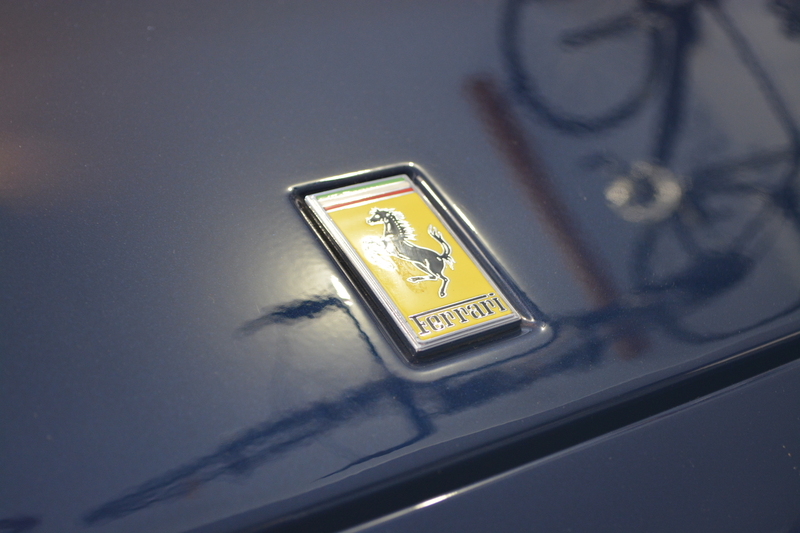 With an engine making 380 hp and a 0-60 time of 4.5 seconds this prancing horse is not only a blast to drive, the exhaust note is a thing of beauty for both driver and passenger. 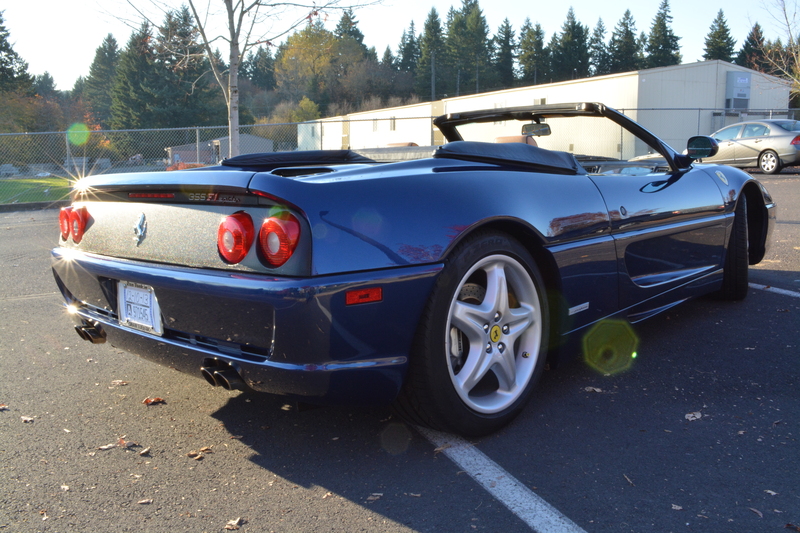 The F1 designation means this 355 is equipped with an electro-hydraulic 6-speed transmission controlled via paddles mounted behind the steering wheel derived directly from tech used in Ferrari’s Formula 1 racing team. 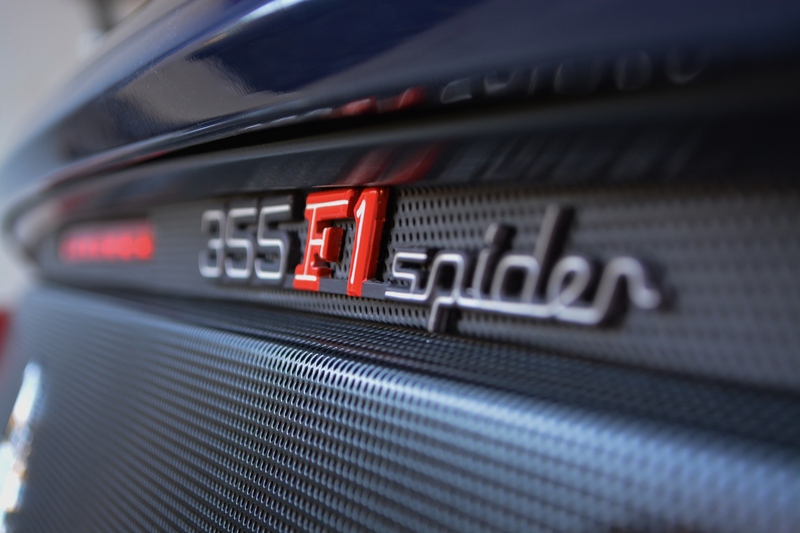 Only 1,053 355 F1 Spiders were produced in the world. A rare breed indeed. 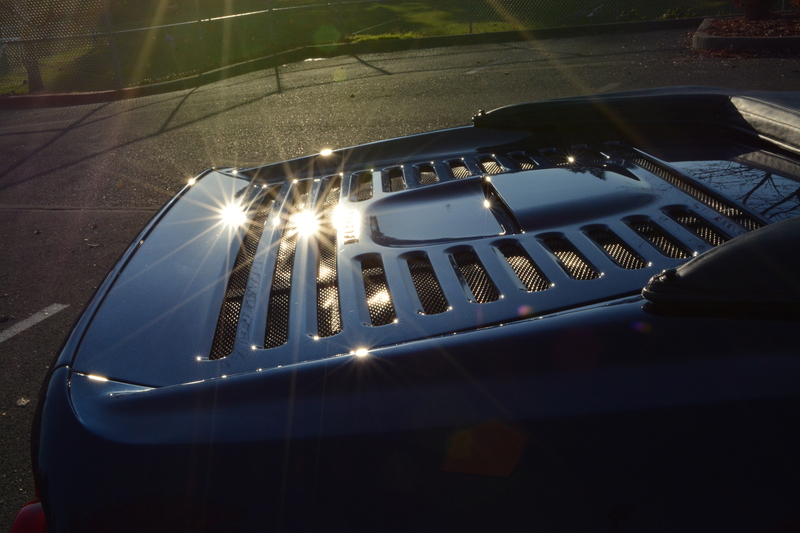 This 355 is equipped with the perforated “challenge” grill option which helps to keep the engine cooler during track use and looks mighty slick in the process. To start off the vehicle was thoroughly washed and clayed to remove any bonded contaminates. This vehicle seemed to have been freshly detailed from the dealership as the paint was nearly spotless (however, not perfect). 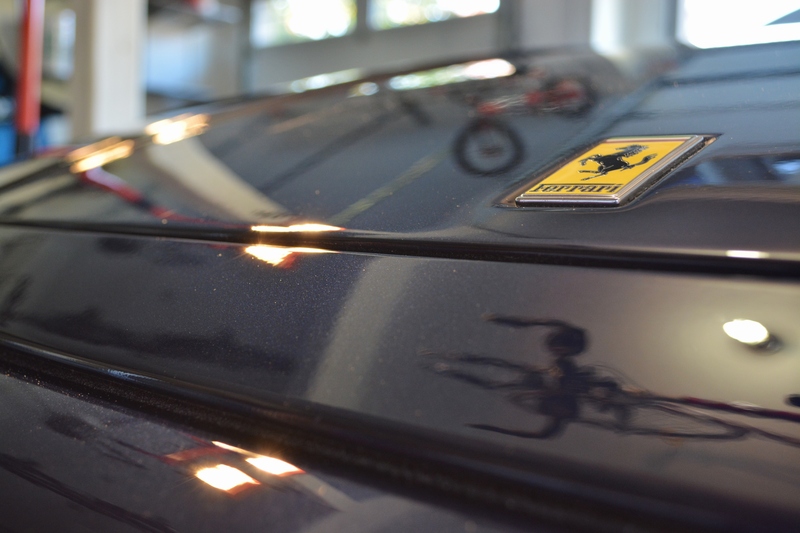 A waterless wash was requested from the owner to mitigate any chance of rust forming anywhere inside the vehicle’s body panels. Here you can see the few bonded contaminates that were safely removed from the paint via detailing clay. 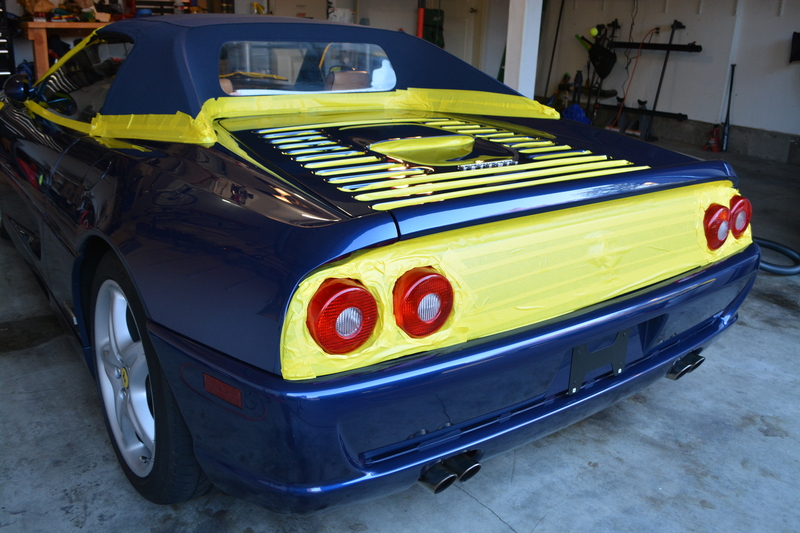 This ensures the vehicle is 100% free of any foreign material prior to beginning the paint enhancement process. 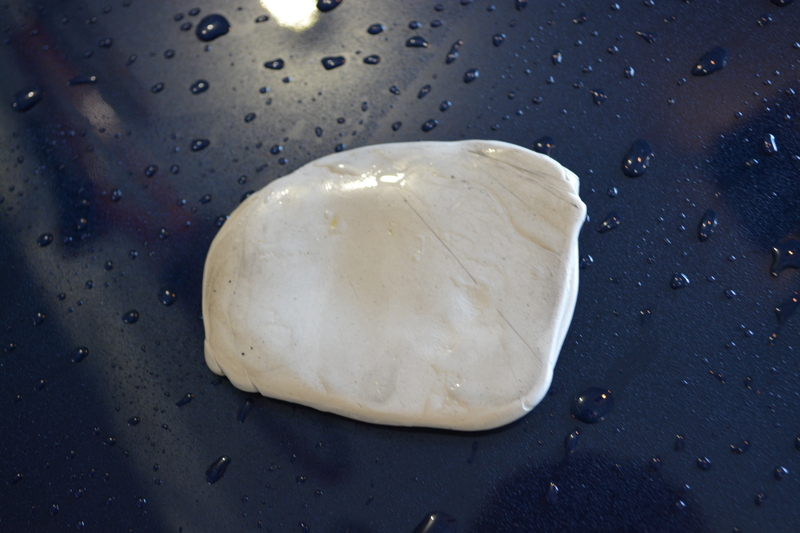 The clay bar process removes imperfections as small as the tip of a pencil and embeds them into the clay. If you look closely at the clay below you will see several dark lines which are the particles that have essentially been absorbed into the clay as it glides over the surface. 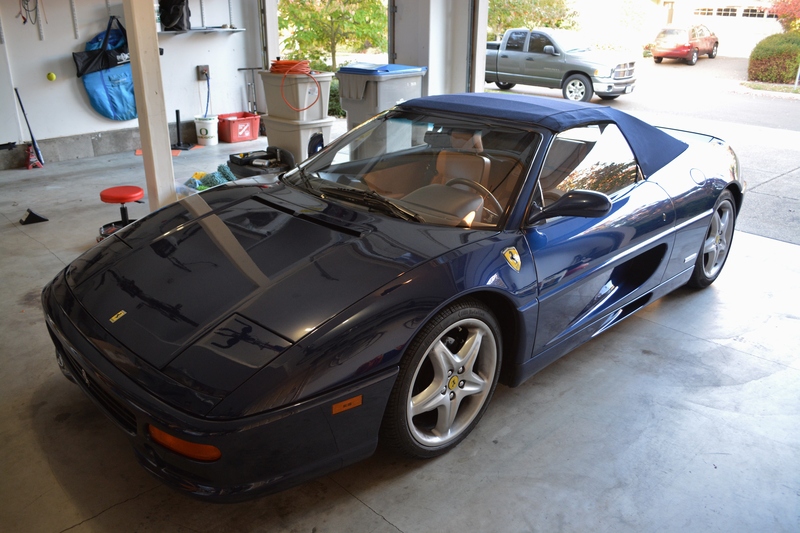 Although this vehicle is the classic example of a “garage queen” it does still get driven. Here you can see a nice film of road grime and brake dust that would need to be dealt with. 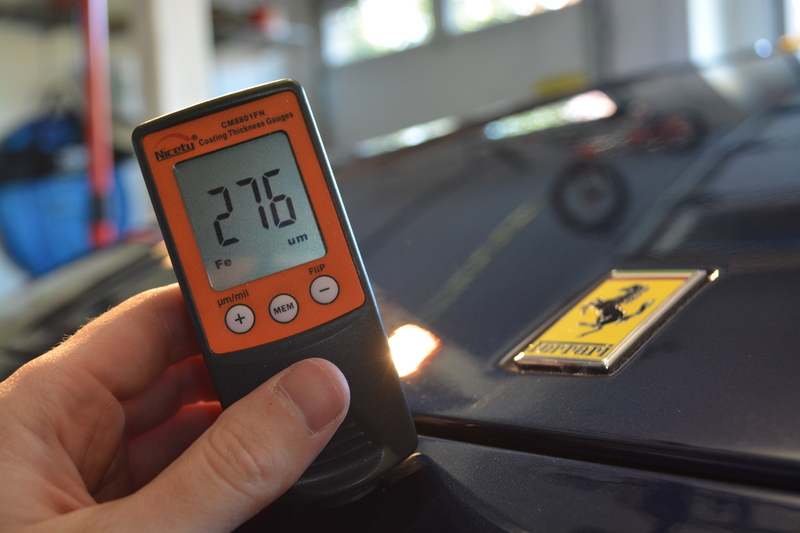 The wheels were thoroughly detailed using pH neutral chemicals safe for specialty wheel finishes and brake calipers. 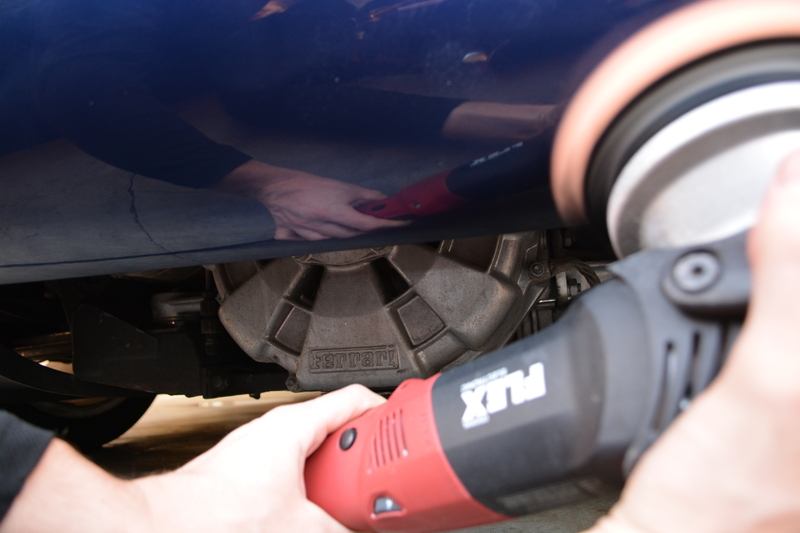 After the vehicle was totally cleaned and dried, all sensitive components were masked off to prevent compounding dust from accumulating in hard to reach areas. We also want to be careful that polish does not get anywhere near the soft top since it would be time consuming to clean. With all the problem areas taped off we are ready to begin a 2-step paint correction process. Polishing paint (correctly) is a time consuming process. 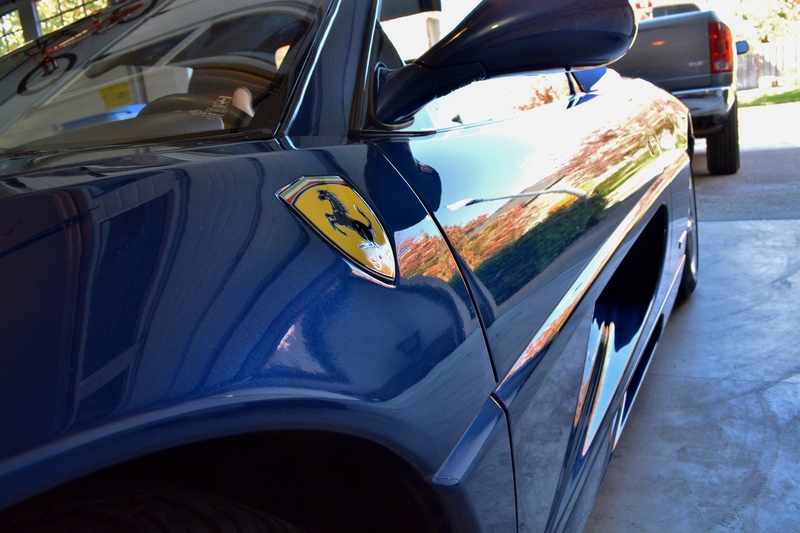 Approximately 17 hours were spent carefully polishing every inch of this Ferrari to perfection. 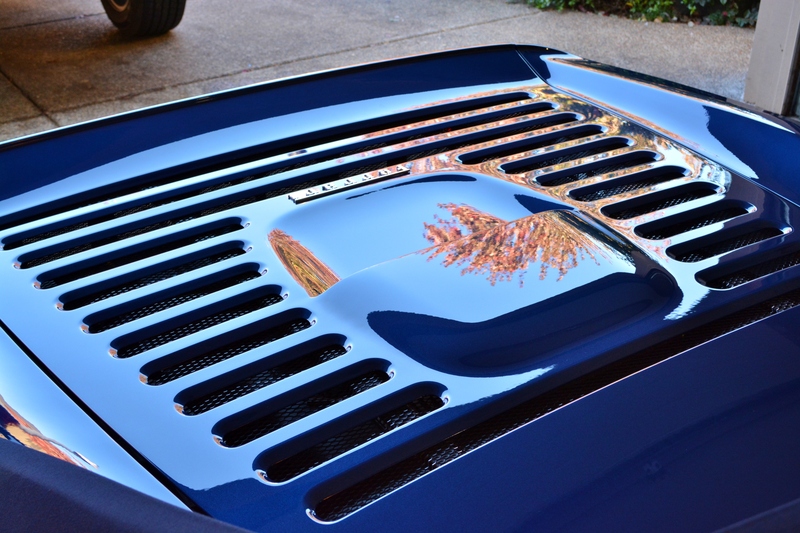 Even areas you would probably never see unless the car was up on a lift, such as below the rear exhaust pipes, were thoroughly corrected to a mirror finish. 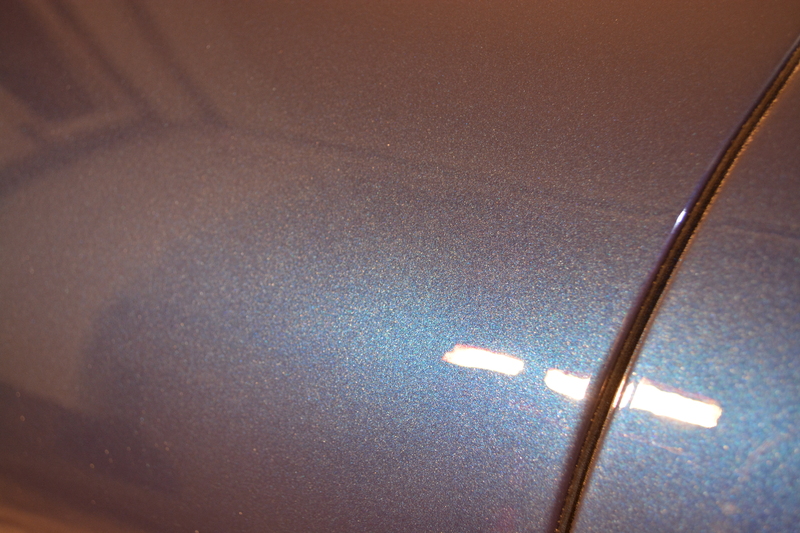 Below is an example of what the finish looked like over the entire vehicle prior to polishing. Light water spots in some areas and riddled with light scratches, swirl marks, and random isolated deep scratches (RIDS). After stage 1 correction. 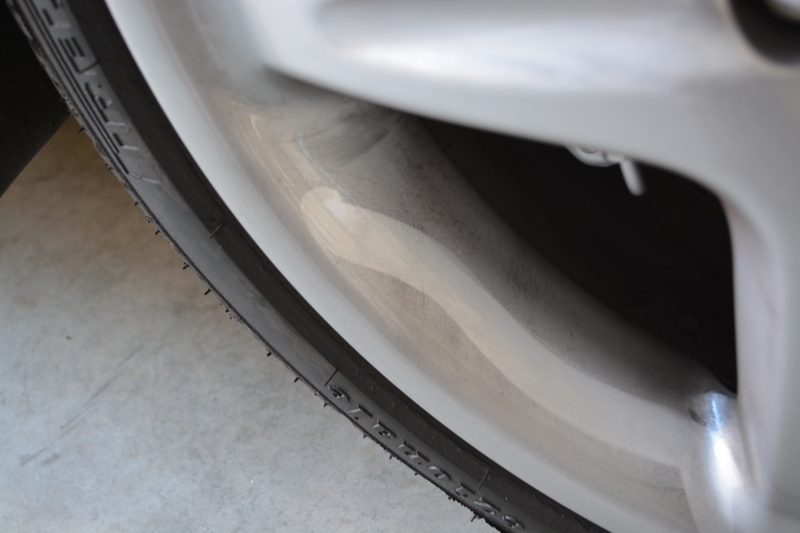 Moderately aggressive polishing pads and super micro abrasive compound was used to produce an almost perfect finish. To most people the finish at this point would be considered perfect; however for this detail we utilized an extra step to further “jewel” the paint to a mirror like finish. 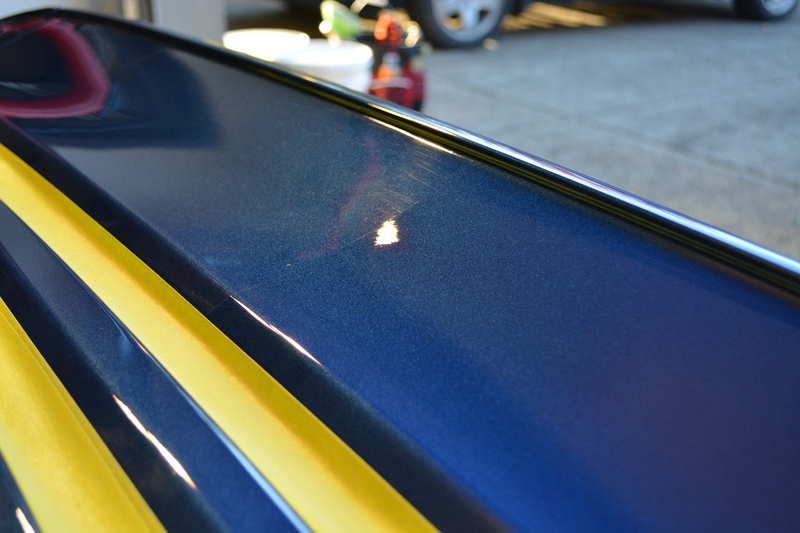 A 50/50 shot of the paint correction process on the rear spoiler. 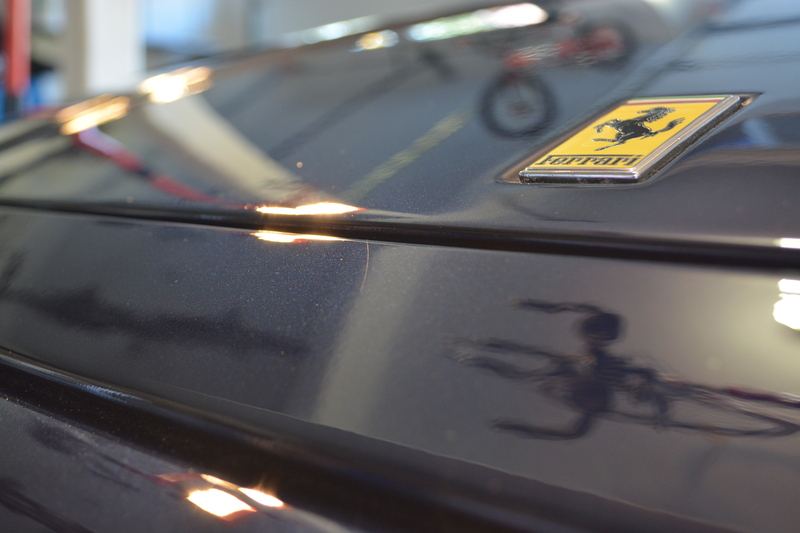 Here a deep scratch remains just below the Ferrari emblem. I know this one is deep into the paint because all of the other scratches and blemishes have already been polished away leaving just this one remaining. 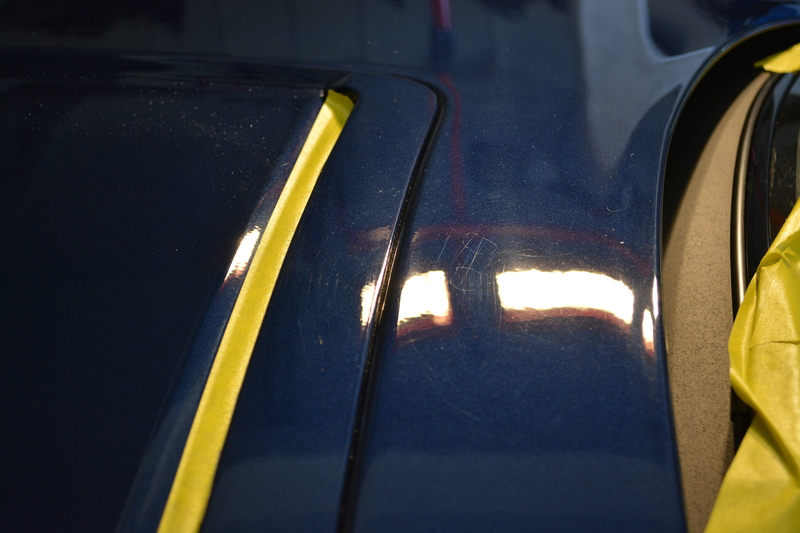 To ensure safe levels of correction are achievable (to make sure I can remove the scratch without removing too much paint) the overall thickness of the base/clear is measured. 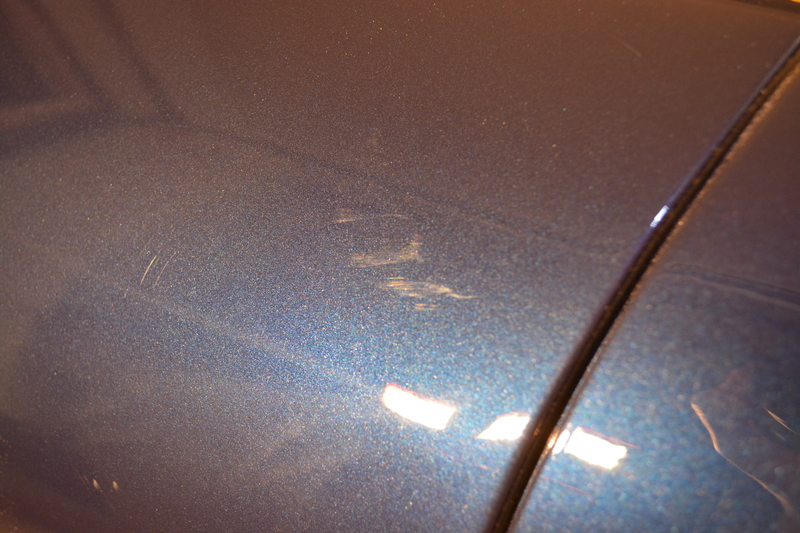 From experience and from measurements taken throughout the vehicle I know that I have enough material to work with to safely remove this scratch without striking through the paint. Here you can see the progress being made on the rear hatch. 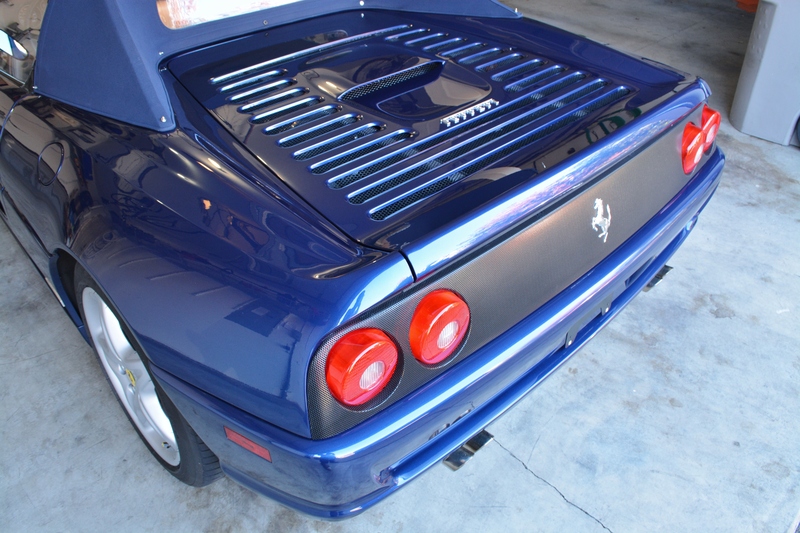 The rear quarter panels had the worst marring out of any panel on the vehicle. This is likely from service workers resting their hands here while working on the engine to check fluid levels or otherwise check components inside the engine bay. 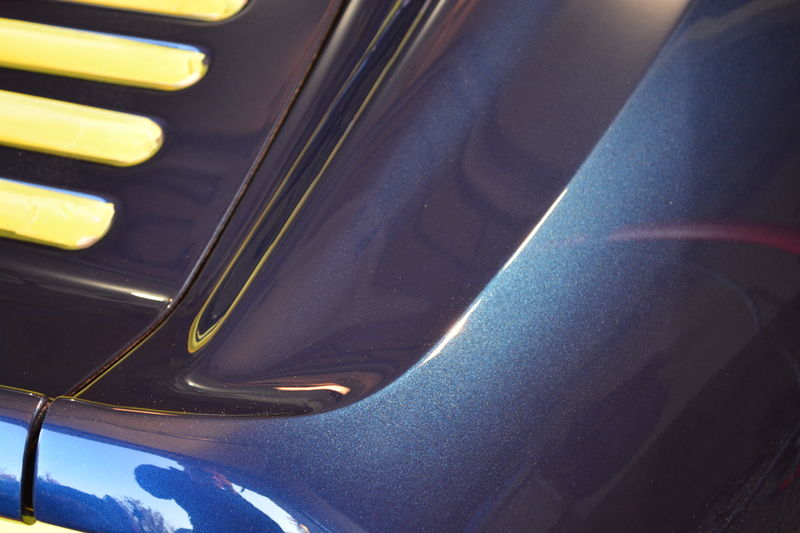 The defects were difficult to capture on the beautiful metallic blue paint, however they were very apparent in person. Another section with bad marring was just behind the passenger door. 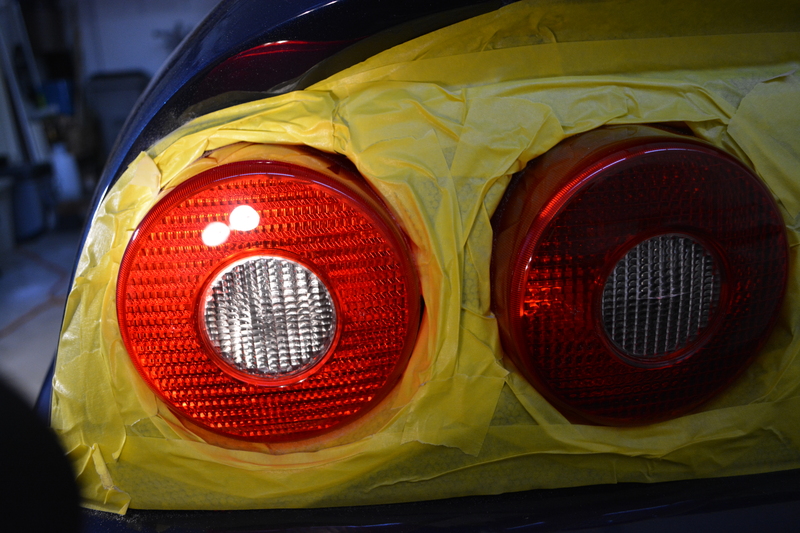 All 4 tail lights were of course polished to perfection as well. 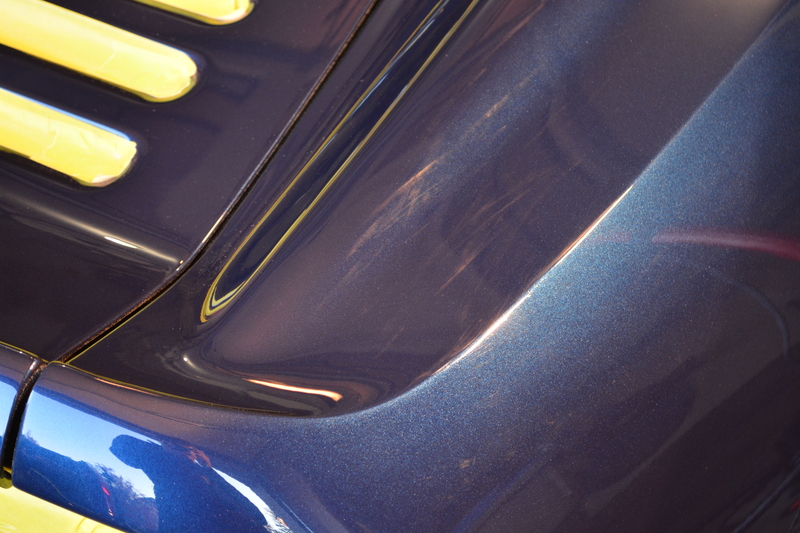 After all correction work is completed the vehicle was treated to a finishing polish to amp up the gloss. 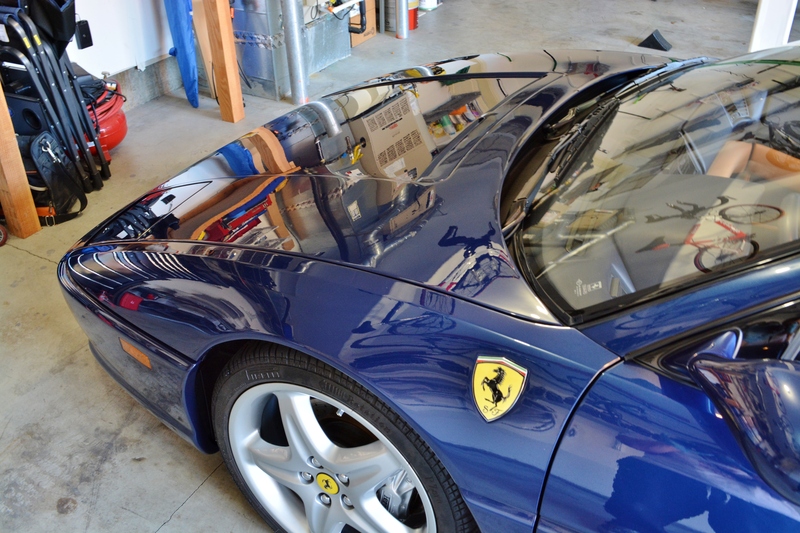 Afterwards, all polishing oils are removed with an Eraser chemical wipe down. 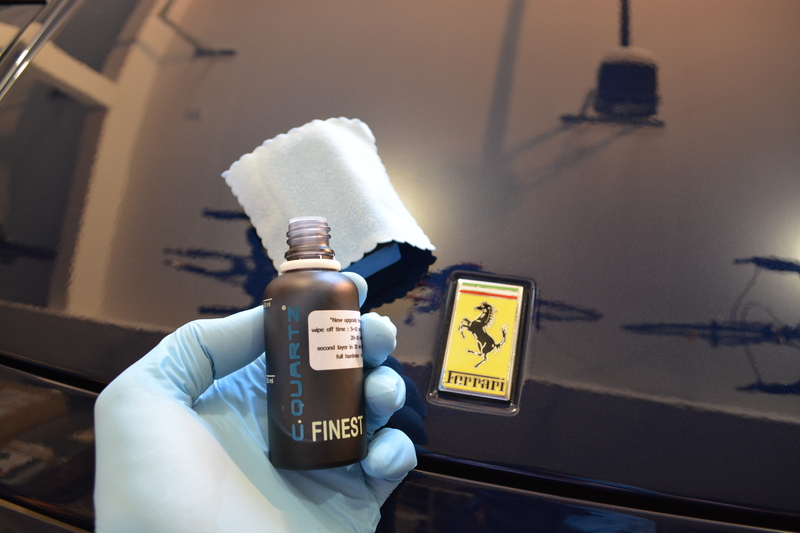 This ensures no “fillers” from the polishing oils have hidden any defects and will allow the CQuartz Finest coating to bond correctly with the clear coat. It is important that the coating be installed correctly, with meticulous prep work, to ensure it lives beyond its 2 year warranty period. 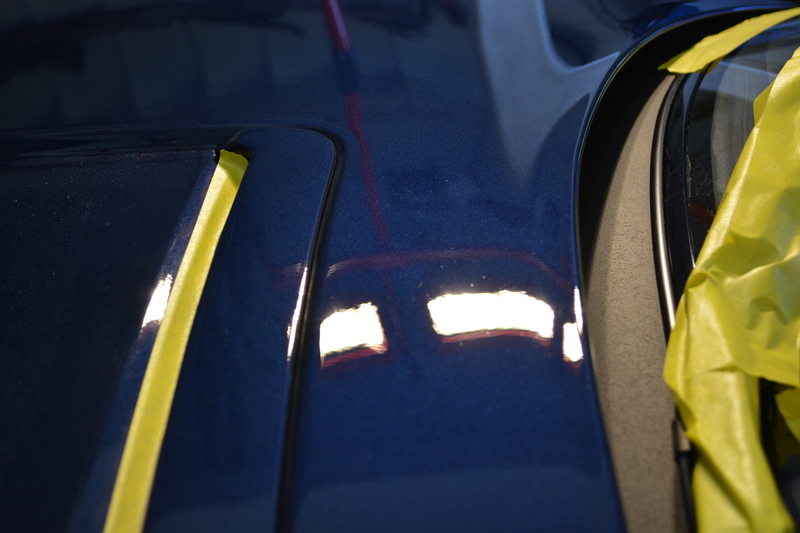 2 thick coats of CQuartz Finest are layered onto all paintwork, trim, emblems, & tail lights to form an ultra hard wearing, hydrophobic, ceramic coating which will shield this now perfect finish from the elements. 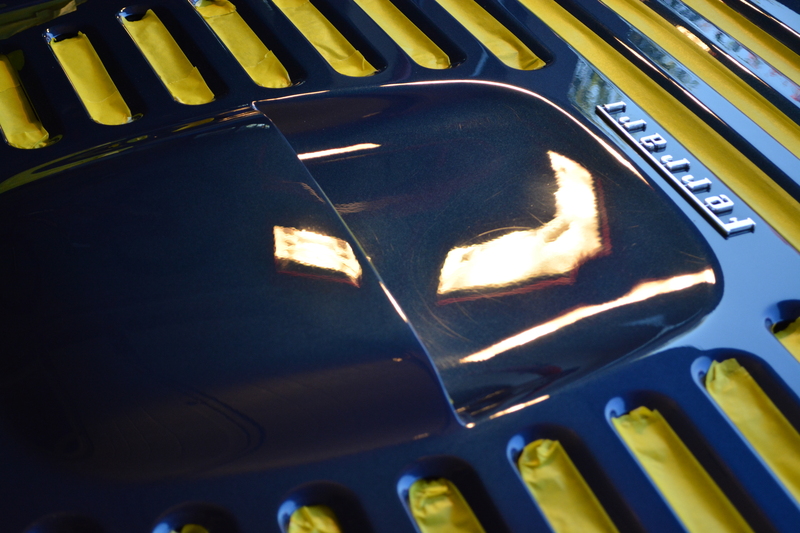 This incredibly glossy shell created by Finest will preserve the underlying finish for a minimum of 2 years while requiring minimal maintenance other than periodically washing using safe wash methods.